Since I started racing a mere 3 years ago (my 3-year runiversary is on 7/14 by the way! ), I've now done about 50 races! 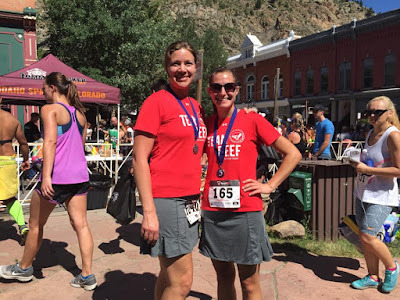 So when I was asked to write about my most REAL race experience for Skirt Sports, I was having some serious trouble deciding which one to go with. Of course all of my "firsts" come to mind - my first 5K, my first Half, my first Full. And then there's the really hard ones - Imogene Pass Run, Pikes Peak, my 50 Miler. But nothing specific was really sticking out. Until last weekend. 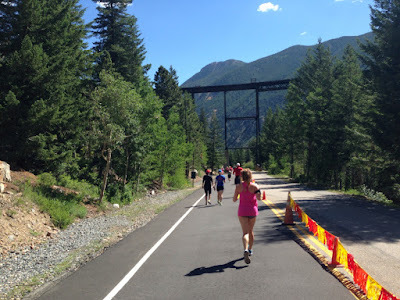 On Saturday, I ran the Slacker Half Marathon - and it was quite the experience, that's for sure! I think I went through every emotion known to man during this race - nerves, stress, frustration, pure and total exhaustion, excitement, and joy to name a few! 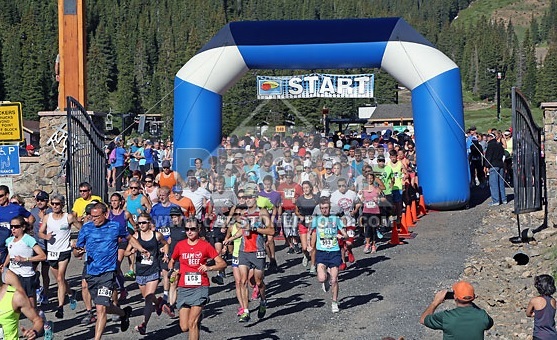 You see, I had this goal to try and run this race in less than 1 hour and 40 minutes. That's a 7:37 pace. That's a pretty lofty goal for me. I still run a 9:30 easy pace...8:00 pace is still hard for me on flat ground. However, I knew this course was mostly* downhill (hence the name slacker), and I've been training on a lot of downhill courses lately to get ready for my downhill marathon next month (less than 3 weeks until go-time by the way!! How did that happen!?). I also ran a 1:41:50 last month at the Mountain to Valley Half. So I decided to just go for it. Could I do it? Maybe, Maybe Not. We would soon find out! So, race day came. I was staying at my parents house, so it was about an hour drive to the start line. The plan was to leave at 5:30am, to make it to the start around 6:30 with plenty of time to use the restroom and catch the bus before the 8:00am start. I even had grand plans of doing a long warm-up pre-race to add a few miles to my day, since this was technically "peak week" of marathon training. Unfortunately things didn't quite go as planned, and this was definitely not a leisurely morning with plenty of time (by a long shot). We left a few minutes late - not a big deal though I thought. We stopped at Starbucks on the way out of town so I could get a bagel for breakfast...yeah that ended up taking WAY longer than it should have. So now we were about 20 minutes behind schedule. Oh well, the buses run until 7:15 I thought, I'll be fine! And then we got to the Georgetown exit off of I-70. Uh-oh. I might not be so "fine" after all. It was way backed up with a huge line just to exit the highway. 1. Do I get in line for the bus so I'm there earlier, and then use the bathroom at the start? 2. Do I get in line for the bathroom, and then get on a late bus, but I won't have to worry about using the restroom at the top? I decided to go with option 2. The lines were seriously insane and I had a feeling this would be my only chance to use the bathroom. So I waited in that line for about 20 minutes. Once I made it through there, it was probably about 7:20am. 40 minutes until race start...and the bus line was still seriously INSANE. They had been busing people, but not very quickly at all. So to the back of the line I went. And I waited, and waited. 7:30. 7:40. 7:50....and still waiting for the bus. I tried to remain calm, I mean surely they wouldn't start the race without everyone getting to the top. But what if they did? I'm so used to having plenty of time at all of my races, this was really not settling and not calming my nerves in the slightest. How in the world was I going to pull off a PR when I'm a nervous wreck?!? Finally, a little after 7:50, a few more buses show up (they didn't have enough to take everyone up at once - and had to make trips - hence why it was so backed up), and I FINALLY got on one! As we were heading up to the start I look at my watch. 8:01. Awesome. 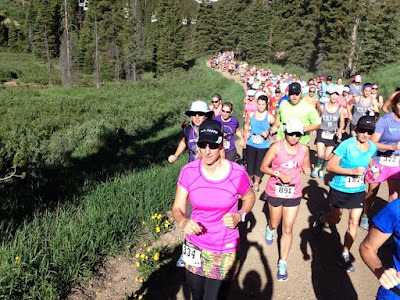 The main piece of advice I had received from people who had done this race before was that it really bottlenecks in the beginning and can contribute to a very slow first mile if you don't' start far enough up. So after we FINALLY made it to the top around 8:08 (and luckily, they had not started yet!! 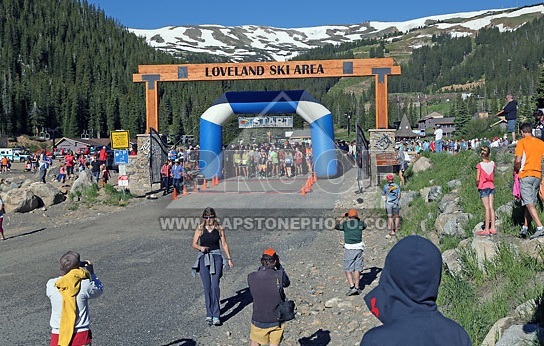 ), I dropped my extra gear off at the drop bag area as fast as I could and ran over to the start line so I could squeeze my way towards the front. 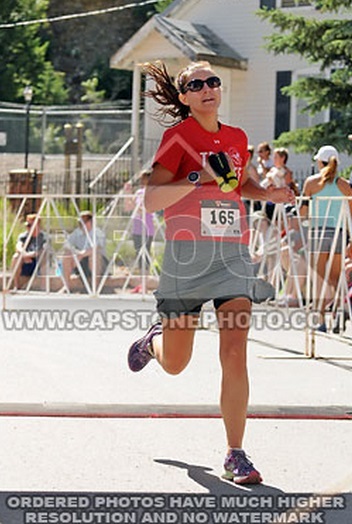 About 2 minutes later, the gun went off (yeah...so much for my relaxing pre-race warm-up I wanted)! Since I was near the front, there's a good chance that I might have gotten a little caught up in the speediness of all the other people starting in front (AKA the REALLY fast runners) and gone out a teeny, tiny bit too fast. And by "teeny, tiny", I mean, WAY too fast. The first 1/2 mile or so was on this real rocky dirt road section and there was some nice slope to it. I honestly was afraid I was going to wipe out because of how fast I started out. I guess that's the one negative part of starting at the front. Luckily, once you're on the bike path, the course is a very run-able downhill and, despite my stress and worry, I was able to settle into a nice consistent pace with some fairly fast miles through mile 6. This whole section meanders through soaring pine trees and it was truly gorgeous. Because of the trees and the curving of the course, it was in-and-out of shade and I knew it was going to be a hot one later in the race, especially if the course became fully exposed later on (spoiler alert: it did). If there's anything my last few long runs have taught me, it's that, the heat is probably going to be my biggest downfall in summer races. I am just not a good hot-weather runner. But I decided to save the worrying of that until later on. Thankfulness once I had finally settled into a nice pace and could enjoy the incredible views (because they truly are - and this is why I run, after all)! This race also had a 3 person relay, and so it actually kind of works out nicely to break the race up into those 3 sections. Right around Mile 6, is where the first set of Relay runners handed off their batons (or whatever they handed off - I didn't actually see if they were carrying anything). This also meant lots of cheering and crowds at these points which was nice. Honestly, the first 6 miles went pretty fast for me, so I was surprised to hit this point. I continued past the small crowd and started what would be the biggest hill of the day. Now, it's really not that bad. The main reason I know that now, is that I still managed a sub-8:00 mile. If this hill had been anything significant, I would have slowed MUCH more than that. But emotionally, it did feel like a HUGE hill. And it didn't help that it was completely exposed. No more nice tall trees. No more shade. I trudged up the hill as best as I could until FINALLY it was done, and I got some downhill again. Although, honestly, it felt to me like miles 6-9 were the flattest of the entire course, especially because all 3 of them were my slowest of the day (but looking at the elevation profile, I'm not sure why I remember it this way - it definitely was downhill). 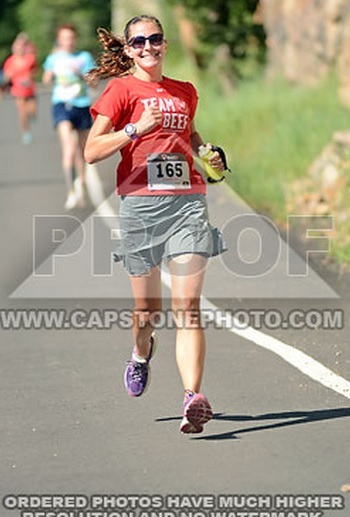 Around Mile 8, the 1:40 pacer passed me with a group of about 6 other runners. My first thought, was, "no problem, I'll just keep up with him from hereon out". Well that always seems to be easier said than done. I wasn't able to (surprise, surprise). I'm not sure what was with me in this section, I know it didn't seem "as downhill" as before, but I was really slowing A LOT. I think the lack of shade must have been a pretty big factor in this. However, I had remembered from studying the elevation profile that the last 3 or so miles before town (emphasis on before) looked like they were a steeper slope than the rest, so I was counting down the miles until I hit that section! Doubt during this entire section. There was NO WAY I was going to get sub-1:40. A PR was even a long shot at this point. Finally, shortly after passing the next relay start (this was also the 4-miler start), I realized, IT DID EXIST! The steep downhill I had thought I had seen on the elevation profile - it was here! I was finally able to get my speed up again! Maybe, just MAYBE I could do it. Although, I still had yet to catch up with the 1:40 pacer. Either way, I could potentially still PR, even if I didn't get under 1:40. So I kept at it as fast as I could. Only 4 miles left. 3 miles, 2 miles. Around 2 miles to go is when I saw the 1:40 pacer again! I really tried to speed up to get to him. I looked at my watch during one of the really steep sections and I was running a 6:30 pace... WHAT!? That didn't last long, but I did manage a 7:00 mile for #12 - pretty good considering how hot it was (and that this was MILE 12!!). About 1.5 to go, I was ALMOST to the pacer. He had lost all of his group, but turned back and yelled to people to hurry it up if they wanted to get in before 1:40. I sped up as much as I could, trying SO hard to catch up with him. And then we got into town. And that hope I had of catching up with him. Yeah, it left. I was trying to keep my pace up, but the course just completely leveled at 12 1/2 and I slowed significantly. I tried to tell myself to just keep going - it's not even ONE mile. You can do this! I tried...but I kept slowing. The pacer was getting further and further in front of me. I kept at it as much as I could though because I did realize by this point that I could for sure at least PR (I needed under 1:41:50 to PR). Then the very last section was rocky and uphill - I pushed as much as I could, but just couldn't keep my pace up. I just kept getting slower and slower until FINALLY, I crested the last hill, got ready to turn the corner to the finish and saw the clock. Hope was not lost! It read 1:39-something. And thank goodness it was a short finishers chute. I could do it! I literally found strength I didn't know I had left and sprinted it out to finish in 1:39:44!!! Pure and Total Exhaustion in the last 1//2 mile. This was seriously, the MOST worn out I have EVER felt in a race. Proud that I managed to keep running strong and finish this race despite all of the frustrations leading up to during the race. So there you have it, my most REAL race experience! All races leave me with a lot of emotions, but this one by far left me with the most, which is why I thought it would be perfect for this blog post (and not to mention, convenient since I needed to recap this one anyways ;)! Not every race is perfect, not every race is enjoyable, but they all teach me something, which is what makes them real. Honestly, I had every excuse in the book prepared to give had I not achieved this goal. Which is why I was so happy with myself that I managed to pull through despite all of that and not give up. This race also taught me that I am capable of running faster and harder than I ever thought possible. I still have no idea where that last bit of strength came from that allowed me to sprint the last tenth of mile, but it was a pretty cool experience that I will never forget. I definitely won't be giving up hope easily in races anymore - you just never know what you can achieve until you're out there, pushing yourself past what you thought was your breaking point! Skirt Sports Ambassador, Lisa's Blog. Check her post out here. Also taken from Lisa's blog. Running under the railroad! A few miles from the race finish. one (until after I caught my breath 5 minutes later)! 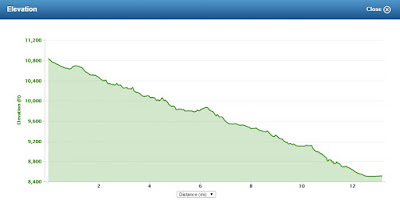 Elevation Profile - see there's definitely some hills in there! After the race, I met and chatted with some fellow Skirt Sports Ambassadors and waited around for part of the post-race raffle. I didn't win anything, but they had a lot of food, and it was neat how the entire main downtown street of Georgetown was blocked off for the event. exact same outfits without realizing it! With Skirt Sports Ambassador Lisa! Race shirt and finisher's medal. but with a slower "gun time". all of my races, but I always forget to get a picture with her!!! Not this time! Great post race - lots of food and drink, fun atmosphere. Waiting around for the buses was just madness. They either need more buses, or they need to start the loading time significantly earlier. So HOT!!! It's light by 5:00am this time of year, so they could easily start an hour or two earlier. Yes, but probably not every year, since it is a bit of a drive for me.